The honeymoon is the beginning of a couple's new life as husband and wife. In these first few days, weeks and months of marriage, the bride and groom now begin to start their new life as a couple. Where they will begin this new adventure is a choice each couple must make based on their likes, dislikes, dreams, budget and time constraints. Honeymoons can range from a short stay at a bed & breakfast inn or nearby hotel, to an outdoor adventure, luxurious spa stay, exciting cruises, or an exotic tropical destination. The decision begins in the hands of the bride and groom, who after discussing each others interests and desires can begin to narrow their choices. If the bride and groom want to travel abroad, the help of a professional travel agent becomes indispensable. Whether the couple knows the exact location of the honeymoon destination or knows they just want to head somewhere warm, travel agents can help to be sure that honeymoon plans become a dream vacation. These experts can help a couple decide what the perfect destination may be and handle every little detail so the couple can do what they should, relax and enjoy being together. Travel agents tell us some favorite honeymoon spots include sunny Jamaica, heavenly Hawaii, festive Mexico or even faraway adventures to Europe or Australia. 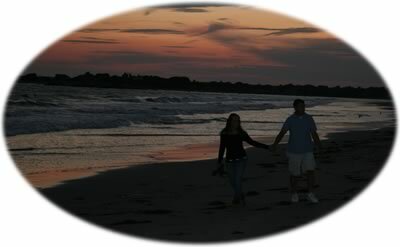 Within the continental United States couples can enjoy the magic of Disney or the romance of the Poconos. There are also trips out west to San Diego, Yellowstone National Park, the Grand Canyon and Las Vegas. Wherever the new couple chooses to go, there are many details to plan and the travel agent knows how to best make those plans. Many travel agents have traveled themselves to a variety of locations and know which hotels to recommend and ideas on places to visit, too. The travel agent is able to help plan flight itineraries, find the lowest prices, and put together packages that include hotel, air and car rentals. Some agents even specialize in helping couples plan a "honeymoon wedding" where the couple actually gets married at a romantic destination and then stays for their honeymoon. One thing all travel agents stress is making reservations as far in advance as possible, especially if a certain destination is in mind. The best rates and best chances for availability sometimes come months in advance. For the couple who does not know where they want to go, the travel agent can work with them to find a locale that fits their interests. One of the most prominent factors a couple considers when planning a honeymoon is the budget. Many couples are now choosing all-inclusive packages so they know in advance exactly what they will be spending. All-inclusive's may include all of your meals and entertainment, things that might be quite costly if you were paying separately. Couples choosing this route should discuss the details with their travel agent, being sure to find out exactly what is included and what is not. Having everything paid for in advance can give the bride and groom peace of mind, knowing once they arrive they can relax and do what they want, without worrying about the cost. Another helpful service many travel agents offer is the option of a payment plan where a certain percentage is paid down and weekly/monthly payments are made until 30 days prior to the date of departure. Some agencies even offer "bridal registries" where family and friends can put money toward the honeymoon as a wedding gift! With the unlimited options available for honeymoon plans, every couple should plan to take time for themselves and enjoy the start of their new life together! * Note that boxes you check now will only appear checked on this computer and NOT on any other computer next time you run this program. Of course, this is only if you do not delete the Wedding Planner cookie. Decide on a travel agent and make an appointment to discuss your options. Decide on a resort or hotel. Visit your travel agent and discuss any special travel needs for your destination. Put deposits on any necessary plans. Apply for passports, if needed for foreign travel. Buy appropriate clothes for trip. Make arrangements to have your suitcases at the reception if you are leaving from there. Confirm travel reservations, or check in with travel agent. Confirm hotel reservations, or check in with travel agent. Confirm flight or travel arrangements, or check in with travel agent. Pack extra contact lenses or glasses. Pack electric plug adaptor (if traveling to a foreign country). Pack Travelers checks and/or cash.